Turkey's foreign ministry has summoned Saudi Arabia's ambassador to Ankara after the disappearance of a Saudi journalist. 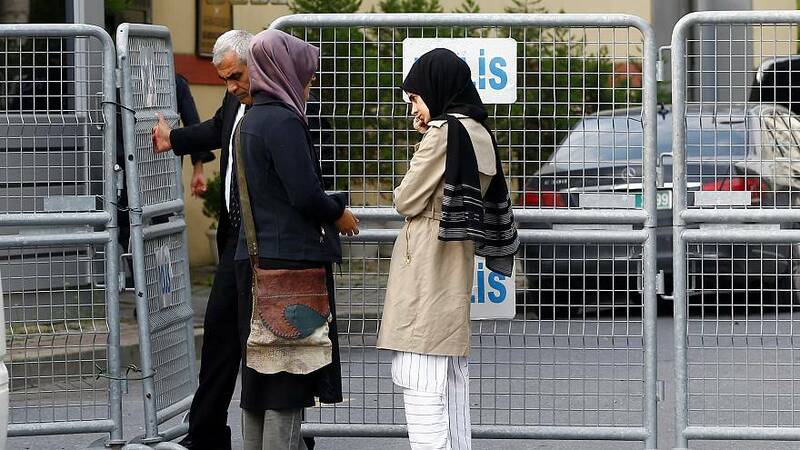 Jamal Khashoggi, 52, visited the Saudi embassy in Istanbul, Turkey, on Tuesday to get paperwork to get married next week but never came out, his fiancée, Hatice, told the Associated Press agency. The Saudi writer was known for criticising the kingdom's crown prince in columns for the Washington Post. "He went in, and as far as I know, he didn't come out. And if he did exit, we have no news of him," she said. "Something has happened to him and we don't know what and how it has happened," she added, declining to give her last name for fear of retribution. Turan Kislakci, Khashoggi's friend and head of Turkish Arab Journalists Association spoke to the AP on Thursday. "We stated that we would be following up this issue, we are following it up. We will be chasing until Jamal walks out. Our first aim is to carry this into the legal dimension and to follow this issue up in the international arena. Secondly, we would like to put pressure together with intellectuals from all over the world," he said. In a statement issued on Wednesday, the Washington Post's international opinions editor, Eli Lopez, confirmed that he had been "unable to reach Jamal today and we are very concerned about where he may be". "It would be unfair and outrageous if he has been detained for his work as a journalist and commentator... we hope that he is safe and that we can hear from him soon," Lopez added. Khashoggi's own website bears a banner reading "Jamal has been arrested at the Saudi consulate in Istanbul!" Saudi Arabia denies it has arrested Khashoggi and said the journalist "exited shortly" after requesting paperwork related to his marital status. "The government of Saudi Arabia follows up diligently on any reports related to the safety of any of its citizens and will continue to follow up on these reports," Saudi authorities said in a statement to the Associated Press. But a spokesman for Turkish President Recep Tayyip Erdogan contradicted Saudi Arabia. "According to the information we have, this person who is a Saudi citizen, is still at the Saudi Consulate in Istanbul. We don't have information to the contrary," Ibrahim Kalin said. Khashoggi has been living in self-imposed exile in the United States for the past few years. A leading Saudi journalist, he extensively covered conflicts across the Middle East between 1987 and 1999 including the Afghan war. He also, on several occasions, interviewed Osama bin Laden. His critical reporting of his native country saw him lose his job as editor-in-chief of Saudi's Al-Watan newspaper in 2003 after only 54 days in the post. A second stint saw him stay at the helm of the media outlet for nearly three years before being fired again in 2010. A television news channel he was in charge of was shut down after only 11 hours on air in 2015. As a contributor to the Washington Post, Khashoggi also criticised Crown Prince Mohammad bin Salman, who, in the last couple of years, ushered in a wave of reforms in an attempt to open up the country. But the reforms — which include allowing women to drive, join the military and attend sport events as well as a return of cinema to the country after 35 years — have also been accompanied by a crackdown on dissent and on human rights activists. In an August 7 column, Khashoggi wrote that "these arbitrary arrests are forcing many into silence, and a few others have even quietly left the country". "There is a better way for the kingdom to avoid western criticism: simply free human rights activists, and stop unnecessary arrests that have diminished the Saudi image," he added. Press freedom groups have also called on the Saudi government to release Khashoggi, including the International Press Institute, which, on Wednesday, wrote a letter to the kingdom's king, Salman bin Abdulaziz. "We fear that Jamal Khashoggi is being held against his will at the consulate for writing article critical of the government of Saudi Arabia," the letter stated. "If, as it claims, Saudi Arabia truly wishes to transition to a more open society, it will have to accept the fundamental rights of freedom of expression and freedom of the press. "Doing so means, as a first and immediate step, releasing all individuals who have been deprived of their freedom for practicing journalism or expressing their opinions, including Mr. Khashoggi," it said. What has Jamal Khashoggi said about Saudi Arabia?